Two things hit my in-box earlier for the, currently showing, Shaun The Sheep. The first is a great list of bits of trivia about the film and our hero. From how many people worked on the film, how much of the film they made a day to how many sweets the editing crew got through in making the film! They are all great. SOme are quite strange but they will all make you smile. The other is a great selection of animated GIFs of the flock. That’s on the next, couple of, pages as there are quite a lot of them. Please download them and use them for your own nefarious purposes on social media. You can even use them on your own website! There are 21 Shaun puppets in total. It takes a week and a half to make a Shaun puppet from scratch. A Shaun puppet stands 17cm tall and weighs 100g. The puppets need constant maintenance. It takes 45 minutes to re-fleece one sheep. The tiniest prop used were Bitzer’s whistle, The Farmer’s glasses and Shaun’s tape recorder. 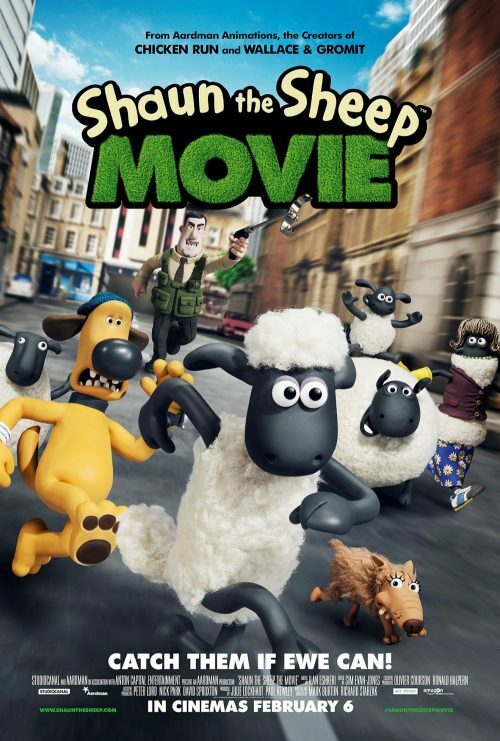 A full crew of 17 animators worked on the Shaun the Sheep Movie, producing an average of 2 seconds of animation per day. The film is comprised of 25 sequences, which range in length from one minute to five-and-a-half minutes each. There were 58 cameras, shooting across 33 units. 549,777 frames were taken – that’s 5.5 billion (British billion, not American billion), or 5,586,174,141,600 pixels. There were 79,237 storyboards drawn. 1,051 of the shots had visual effects on them, ranging from tiny clean-ups to major CG shots. The edit department got through 8 catering-size tubs of kids sweets during production. Shaun is 11 years old in sheep years! Shaun first appeared in Wallace & Gromit short film, A Close Shave, 20 years ago. Just click on the pages below to see all the GIFs.